1) Tough, Lightweight Construction for maximum performance, satisfaction, confidence and reliability. 2) Quality Handles made of high temperature material that absorbs hand perspiration. 3) Smooth Revolving Handles - teflon handles reduce friction and maximize turning control and comfort. 4) Handles Strength - handle will not bend when squeezed together (as other Irons). 5) Supreme Heat Control - barrel retains temperature for a long period of time. 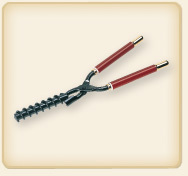 6) Barrel Centering - barrel of Curling Iron is centered for Maximum performance. 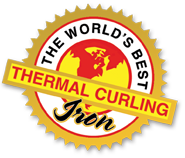 7) Outstanding Heat Distribution - - more even heat distribution in the Curling Iron barrel due to the ends being closed. 8) Perfect Balance - for even weight distribution and ease of operation. 9) Beautiful Finish - natural color for beauty and easy cleaning. 10) Outstanding Packaging - every Curling Iron is sealed in a plastic sleeve or blister packed. Both types of packaging include drawings of actual sizes and types of curling irons and accessories available from Golden Supreme. 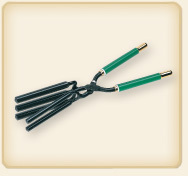 You can purchase GOLDEN SUPREME CURLING IRONS at your nearest Beauty and Barber Supply Store or online.